Building on last year's solidly entertaining motorcycle racer, THQ's MotoGP 07 for the Xbox 360 features a number of improvements and additions that make this one of the better arcade racers on the market. The most noticeable changes lie in Moto GP 07's improved handling, which makes for more responsive and easier to use bikes, which makes racing more accessible and less frustrating at earlier levels while retaining a high level of challenge in its later stages. Additional online tournaments, including slip racing modes add to the excitement. 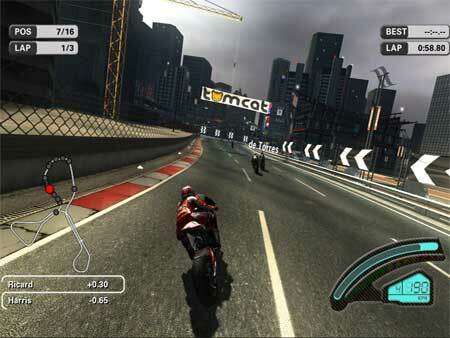 Between its smooth control and enhanced presentation, Moto GP 07 is another solid racer for THQ. 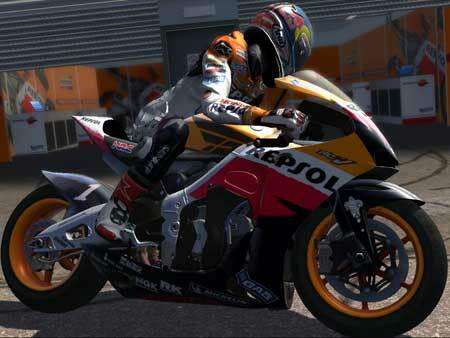 THQ's Moto GP 06 slipped under the radar of most gamers and journalists last year but, this solid racer offered some quite challenging and entertaining racing for gamers looking for a speed rush. The game's simple arcade-style approach, stripped down interface, accessible gameplay and slick graphics made Moto GP 06 a definite winner on 360. This year's installment is exclusive to the console again and adds to everything that made the first game great in subtle and significant ways, and this makes for another challenging game. As in last year's installment, Moto GP allows players to experience the real Moto GP tournament with all the authentically licensed riders and tracks you've come to expect plus a few more for this year. Many of the expected modes are present and the game includes single race, tournament and career modes in addition to bonus games and challenges to keep you occupied. There are two basic classes of race you can choose from: Grand Prix which includes a selection of the real courses and Extreme, which take place in more exciting, somewhat fantastic locations. Each mode offers more than a dozen tracks and there are over thirty in all, which offers plenty of versatility from speed to skill tracks. The tracks remain similar to last year in terms of structure, but seem to have been graded a little bit differently so you won't find yourself spinning out during hairpins nearly as much this time around. There are still plenty of challenging hairpins and sudden curves, but they seem easier to take overall, which allows you to concentrate on the racing at hand. The standard race modes are challenging, but Climax has added additional post-race categories, such as clean corners, podium finishes and section leads that add more stats to your characters. As you race, you'll be able to unlock additional bikes which you can then tweak and adjust in your garage - this allows you to change the bikes' performance to suit each track, giving Moto GP 07 more under-the-hood depth than its predecessor. Once you get on the track, you'll find that things are just as smooth as you remember in many ways, but there have been a few changes. While actual racing in Moto GP 07 doesn't feel materially different, with similar interface and controls, subtle adjustments have been made to the bikes' performance and realism that makes them feel both more authentic and easier to control. This makes for a much smoother gameplay experience on the track which allows you to flow with the action. This arcade-style approach in the early stages allows experienced gamers to jump right into the action without missing a beat. You'll immediately notice the enhanced physics, which results in a smoother ride overall. The bike physics are quite impressive in their own right and give you an excellent sense of riding on an actual motorcycle, especially in the first-person perspective. Your field of vision is excellent and the game's layout and design is clean and efficient with the indicators and gauges place unobtrusively off to the edges of the screen. One minor addition this year is the Telemetry feature that allows you to call up the results and times of your race while its happening in order to gauge your time on each section of the track. This adds even more statistical detail to the game. More important changes are more subtle but significant. Moto GP 07's AI also seems to be more sophisticated this time around, since the opposing riders seem less likely to cluster in packs and become more aggressive when they fall behind. This makes them less predictable than last year's game and makes the other rivals more realistic opponents. The increased difficulty adds to the game's realism and this enhanced fidelity makes each race even more intense. In addition, Moto GP 07 offers additional mini-game style diversions including a number of timed challenge and practice modes. Going through these is much faster and less taxing than the main game, with the added bonus that successfully completing these adds to your stats. These act as excellent training missions which allow you to fine-tune your performance and learn skills while you build up medals and rewards that unlock additional tracks and riders. From a visual standpoint, the game looks solid with excellent bike models and trackside detail flying by at a speedy, consistent frame rate. It doesn't look quite as polished or slick as Forza 2 or even Dirt, but it's a big improvement from last year's installment. The camera was a bit iffy, but the close-up angles don't feel as jerky or jarring this time around when you tilt your bike which allows for a smoother experience that allows you to focus on the action. Trackside details have also been improved dramatically and this increases your immersion into the game significantly. Moto GP 07's production values are excellent and this makes for a more enjoyable experience. Aside from the visual upgrades, most players will be happiest to learn that the game's single-player modes are solidly entertaining and Moto GP 07's online features have also been enhanced and expanded dramatically and this is now a fully-realized, robust feature instead of an appendix. There are now 16-player simultaneous tournaments desgined to maximize the intensity as well as a new one-on-one slip racing mode where you can bet the bikes in your garage in a single race. These additions add depth and replay value to the game and make for a racing game with a surprising amount of longevity. Connecting to the servers and setting up games is simple, quick and easy thanks to Xbox Live and the game play is remarkably stable and lag-free when competing online. 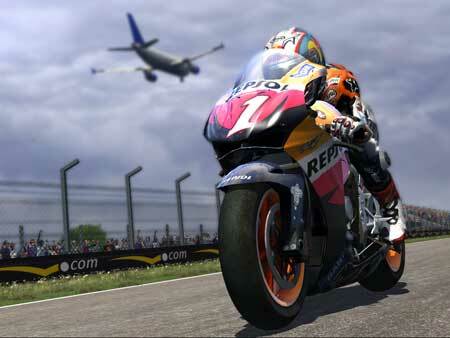 The online features add to Moto GP 07's appeal and make this one of the better online racing titles we've played. Overall, this is a solid package whether you play alone or against friends online. There are several new game modes online and while the tweaks and changes might seem minor in isolation, together they create a racing experience that has been improved dramatically. While there may be a slight sense of déjà vu at first, the enhancements and additions to Moto GP 07 are significant enough to merit our recommendation.